Vinyl Back Cocoa Mat Road Rollers are are made from the fibers of the nearly indestructible outer husk of coconuts. To make securing to equipment much more simple than woven-back cocoa mats, a black vinyl backing is bonded with the fibers. 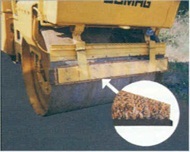 Another large advantage over woven-back cocoa mats is that our Vinyl Back Cocoa Mat Road Rollers can easily be cut down to fit, without the matting unraveling on you. A punch or sharp knife is all that is needed if small holes are required for installation. Sizes: Sold in 32' 9" rolls with heights of 4", 6", 8", 9", 10" and 12"
Receive an additional 5% off on orders of 10 or more.